Today, a federal grand jury in the District of Columbia returned an indictment* presented by the Special Counsel’s Office. 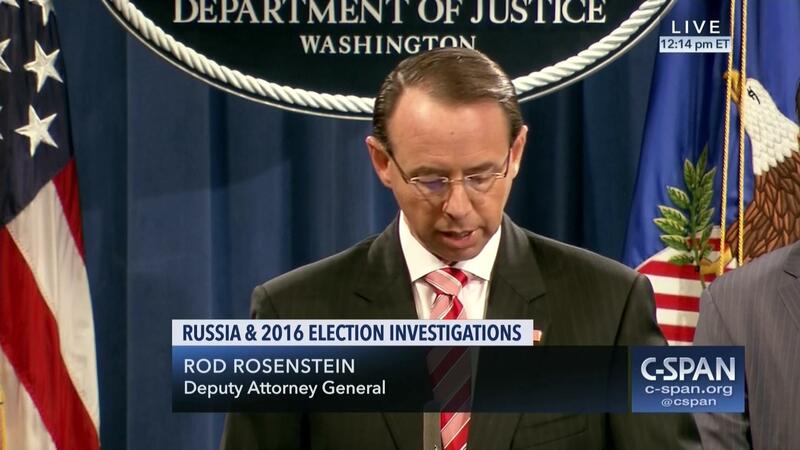 The indictment charges twelve Russian military officers for conspiring to interfere with the 2016 presidential election. Eleven of the defendants are charged with conspiring to hack into computers, steal documents, and release documents in an effort to interfere with the election. One of those defendants, and a twelfth Russian officer are charged with conspiring to infiltrate computers of organizations responsible for administering elections, including state boards of election, secretaries of state, and companies that supply software and other technology used to administer elections. According to the allegations in the indictment, the defendants worked for two units of the Main Intelligence Directorate of the Russian General Staff, known as the GRU. The units engaged in active cyber operations to interfere in the 2016 presidential election. One GRU unit worked to steal information, while another unit worked to disseminate stolen information. The defendants used two techniques to steal information. First, they used a scam known as “spearphishing,” which involves sending misleading email messages and tricking users into disclosing their passwords and security information. Second, the defendants hacked into computer networks and installed malicious software that allowed them to spy on users and capture keystrokes, take screenshots, and exfiltrate data. The defendants accessed the email accounts of volunteers and employees of a U.S. presidential campaign, including the campaign chairman, starting in March 2016. They also hacked into the computer networks of a congressional campaign committee and a national political committee. The defendants covertly monitored the computers, implanted hundreds of files containing malicious computer code, and stole emails and other documents. The conspirators created fictitious online personas, including “DCLeaks” and “Guccifer 2.0,” and used them to release thousands of stolen emails and other documents, beginning in June 2016. The defendants falsely claimed that DCLeaks was started by a group of American hackers and that Guccifer 2.0 was a lone Romanian hacker. In addition to releasing documents directly to the public, the defendants transferred stolen documents to another organization, not named in the indictment, and discussed timing the release of the documents in an attempt to enhance the impact on the election. In an effort to conceal their connections to Russia, the defendants used a network of computers located around the world, and paid for it using cryptocurrency. The conspirators corresponded with several Americans through the internet. There is no allegation in the indictment that the Americans knew they were communicating with Russian intelligence officers. In a second, related conspiracy, Russian GRU officers hacked the website of a state election board and stole information about 500,000 voters. They also hacked into computers of a company that supplied software used to verify voter registration information; targeted state and local offices responsible for administering the elections; and sent spearphishing emails to people involved in administering elections, with malware attached. The indictment includes eleven criminal charges and a forfeiture allegation. Count One charges eleven defendants for conspiring to access computers without authorization, and to cause damage to those computers, in connection with efforts to steal documents and release them in order to interfere with the election. Counts Two through Nine charge eleven defendants with aggravated identity theft by employing the usernames and passwords of other persons to commit computer fraud.